The most-viewed piece on this blog is Women’s Rights and the National Struggle, 1916-1922. This has now had over 10,000 views. Hope folks have found it useful! Again, I’ve been rather lax with the blog, due to other commitments – and, I must admit, a certain amount of inertia. . .
My priorites right now are getting up more of Fintan Lalor’s articles from the 1840s and also starting to get up articles by Sean McLoughlin, appointed Cmdt-General by Connolly towards the end of Easter Week. Sean McL later played an important role in both the original and sadly shortlived Communist Party of Ireland (founded by Roddy Connolly) and in James Connolly’s Socialist Labour Party in Scotland. He is the subject of a fine biography by Charlie McGuire. Charlie deserves much respect for rescuing Sean McLoughlin from obscurity. Every socialist-republican should buy Charlie’s book. I am also keen to get other people involved in the blog: book and film reviews, historical pieces, and also contemporary economic analysis are particular areas of interest. At present it’s essentially me, with some articles by my friend Mick Healy. But Mick has The Irish Republican & Marxist History Project to keep him busy as his primary on-line focus. 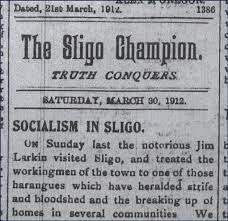 I also want to advertise other blogs more consistently, such as the Irish Republican & Marxist History Project and John Bull’s Workhouse (about the six-county state and economy), which Belfast socialist-republican Liam O Ruairc (an occasional contributor to this blog) and veteran Cork socialist-republican Jim Lane are involved in. Plus I will link more to material on sites such as Eirigi and Saoradh, as well as continuing to re-blog and link to stuff by Socialist Democracy. Between the death of my father a couple of weeks ago and a massive load of work-work, the blog has again taken a back seat. As of the end of next week, however, I will be unemployed. I have work to do on my house, with an overgrown back yard of fruit, herbs and veges being strangled by weed and I have some stuff to do inside too. Apart from that, however, I hope to make a bit more progress on getting things up on the blog. I am still in the process of considering the future of this blog, but will be taking a little bit longer to make up my mind about things. In the meantime, I want to get a few book reviews up and also to finish a piece on Fintan Lalor. And I’m still looking for people to contribute pieces on Ireland from a Marxist-republican perspective. Just a short note on the future of the blog. In the past, up til about a year ago, I tried to get heaps of stuff up on the site and cover lots of small things that were happening in Ireland. However, it’s proved to not be possible to keep doing this and attempting to do so has become exhausting and also gotten in the way of having time (and energy) to get up more substantial stuff. So, from now on, I won’t be making any attempt to cover various events as they happen within Ireland. Instead I’ll put in links to stories on particular struggles maybe once a week – or once a fortnight if not much is happening at any time – from socialist-republican sites. They have members on the ground involved in these struggles and do much more ongoing articles on them than I ever could. At the end of this year, I’ll also review whether it’s worth continuing the blog. In the meantime, I’m really keen to run book and film reviews that anyone might fancy contributing, anything on the Irish economy/ies, the new political dispensation in the six counties, historical material, etc etc. To readers and supporters of this blog, Nollaig shona daoibh agus athbhliain faoi mhaise daoibh. The last six months of 2014 have been extremely hectic for me personally and one result is that this blog has taken a bit of a back seat. Lots of stuff I had hoped to do simply didn’t get done. In the New Year I will be extremely busy personally for maybe 4-6 weeks, but hope to get a few new pieces up on the blog. After that, I’m hoping the blog will finally return to ‘normal’, with more in the way of feature pieces on Ireland today, especially politics and economy, as well as continuing historical stuff. On the history side, for instance, I want to do some stuff on Fintan Lalor. And I will continue to be lobbying for socialist-republicans to form joint committees to organise major activities around the 100th anniversary of the Rising.